Gelato is a silky traditional Italian ice cream, and armed with a few homemade gelato recipes you can create your own version of this popular treat. While gelato has many of the same ingredients as ice cream, the difference between the two is that gelato is made with whole milk and cream and has less than 55% air, which results in a denser, more intense flavor. 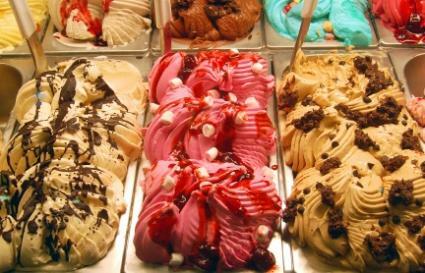 Gelato is said to have been created in the 16th century when the creamy dessert appeared at the court of Caterina dei Medici. Over the next four centuries the art of making this creamy dessert was passed on from father to son. Eventually, as Italians emigrated throughout the world, a love for gelato was transported to many countries around the world. 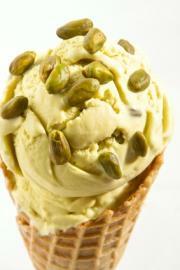 The basic components of gelato are whole cow's milk, sugar, and the chosen flavoring. Because it doesn't contain as much cream as American ice cream, gelato is softer in texture, melts faster and is lower in fat. To make homemade gelato, all you need are a few key ingredients and a simple ice cream maker. Here are a few simple recipes to get you started. Pulse hazelnuts with sugar and salt in a food processor until finely ground. Transfer nut mixture to a medium saucepan, add milk and bring to a gentle boil, stirring occasionally. Remove from heat, cover and let sit for about 20 minutes. Strain milk mixture through a sieve into a small bowl and whisk in cornstarch. Return milk/cornstarch mixture to the saucepan and bring to a gentle boil over medium heat for about 2 minutes, whisking constantly. Once the mixture is thick, remove from heat and add chopped chocolate, whisking until melted and incorporated uniformly. Pour mixture into a bowl and chill in the refrigerator overnight, stirring occasionally. Following the directions for your ice cream maker, freeze mixture and then transfer to an airtight container and place in freezer for about 5 hours or until firm. Bring 2 cups of milk to a gentle boil in a medium saucepan over medium heat. Add chopped chocolate to the hot milk and whisk in until completely melted. Remove from heat. Combine remaining cup of milk, sugar and cornstarch in a small bowl, whisk together and then add to hot milk/chocolate mixture. Return saucepan to heat and cook, stirring constantly until mixture thickens, about 7 to 10 minutes. Preheat oven to 350 degrees F. Bring a medium saucepan of water to a boil, add pistachios and cook for about 30 seconds, then drain. Let pistachios cool and then remove and discard outer skins. Spread nuts on a baking sheet and toast in oven for 5 minutes. Cool completely and coarsely chop. In a medium saucepan combine milk and chopped pistachios. Bring milk to a gentle boil, cover pan and remove from heat. Let the mixture rest for 2 hours. Pour milk/pistachio through a sieve into a medium bowl and discard solids. In an electric mixture combine egg yolks and sugar and cream together on medium-high speed until thick and pale yellow for 3 to 5 minutes. Bring milk back to a simmer over medium heat. Add half of the warmed milk to the egg yolk/sugar mixture and whisk until blended. Return to saucepan with remaining milk and cook over low heat, stirring constantly until mixture is thick and coats the back of a wooden spoon. Remove saucepan from heat, and stir in cream. Pour the mixture through a sieve over a medium-sized bowl and put bowl in freezer to chill for about 30 minutes.